Nowadays, in the world of technology, the term AR and VR so common. Augmented reality (AR) is a live direct or indirect view of a physical, real-world environment whose elements are “augmented” by computer-generated or extracted real-world sensory input such as sound, video, graphics, haptics or GPS data. Google shut down Tango AR platform. 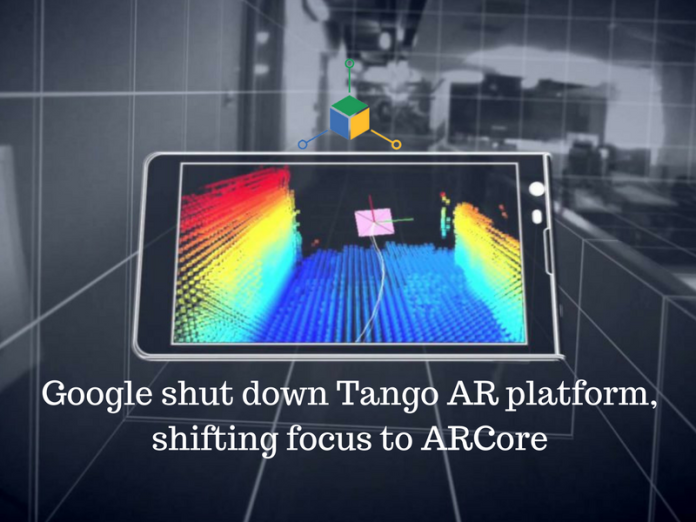 Tango is an Augmented reality(AR) computing platform, developed and authored by the Advanced Technology and Projects, a skunkworks division of Google. The augmented reality platform it launched in 2014. It used computer vision to enable mobile devices, such as smartphones and tablets, to detect their position relative to the world around them without using GPS or other external signals. This allows application developers to create user experiences that include indoor navigation, 3D mapping, physical space measurement, environmental recognition, augmented reality, and windows into a virtual world. The company says it looks forward to “continuing the journey” through its new AR toolkit, ARCore. building augmented reality apps for a broad range of devices without the requirement for specialised hardware. The platform simplifies things a bit, focusing on plane detection rather than building a 3D mesh of the space. This allows ARCore functionality to run on popular phones like the Galaxy S8 and Pixel that don’t have crazy multi-camera IR setups on them. Previously, Lenovo is served with the augmented reality(AR) by tango project. The new AR platform has been rolled out to Google Pixel and Samsung S8 which run on Android 7.0 Nougat and above. ARCore works with ‘Java/OpenGL’, ‘Unity’ and ‘Unreal’ technologies focuses on three features — motion tracking, environmental understanding and light estimation. Previous articleNet neutrality: fight to keep the internet free now dead, what next?